Baking refers to the act of storing or caching the results of a calculation. The result of a simulation is automatically cached to memory when the animation is played, so that the next time it runs, it can be replayed more quickly by reading the results from the memory. If you bake the simulation the cache is protected, and you will be unable to change the simulation settings until you clear the baked frames by clicking Free Bake. It is generally recommended to bake your physics simulations before rendering. Aside from no longer needing to go through the time-consuming process of simulating again, baking can help prevent potential glitches and ensure that the outcome of the simulation remains exactly the same every time. Most physics simulators in Blender use a similar system, but not all have exactly the same settings available. All the settings are covered here, but individual physics types may not provide all these options. Blender allows for storing and managing multiple caches at once for the same physics object. You can manage the caches with this list view. Caches can be added and removed with the Plus and Minus buttons. Renaming a cache can be done by either double-clicking or pressing Ctrl-LMB on the desired cache. Share the disk cache when the physics object is linked into another blend-file. When this option is enabled, linked versions of the object will reference the same disk cache. Otherwise linked versions of the object will use independent caches. The compression level for cache files. Some physics caches can be very large (such as smoke). Blender can compress these caches in order to save space. Do not compress the cache. Compression will optimize the speed of compressing/decompressing operations over file size. Compression will result in smaller cache files more than Light, however, requires more CPU time to compress/decompress. Allows you to read the cache from a drive using a user-specified file path. 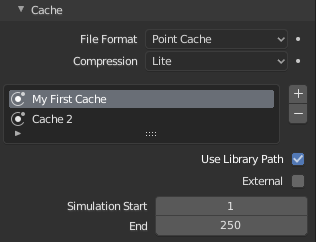 The cache name in Caches List and the Index Number has to exactly match the external cache files name in order to work. The cache files name format is name_frame_index.bphys. Select the directory path to the cache files. Frame on which to start the simulation. Frame on which to stop the simulation. The simulation is only calculated for positive frames in between the Start and End frames of the Cache panel, whether you bake or not. So if you want a simulation that is longer than the default frame range you have to change the End frame. Interval for storing simulation data. Some physics systems (such as particles) allow for positions to be stored only on every nth frame, letting the positions for in-between frames be interpolated. Using a cache step greater than one will result in a smaller cache, but the result may differ from the original simulation. Start baking. Blender will become unresponsive during most baking operations. The cursor will display as a number representing the progress of the baking. You need to be in Object Mode to bake. Mark the baked cache as temporary. The data will still exist, but will be removed with the next object modification and frame change. This button is only available when the physics system has been baked. Bake only up to the current frame. Limited by End frame set in the cache settings. Store any temporarily cached simulation data as a bake. Note that playing the animation will try to simulate any visible physics simulations. Depending on the physics type, this data may be temporarily cached. Normally such temporary caches are cleared when an object or setting is modified, but converting it to a bake will "save" it. Bake all physics systems in the scene, even those of different types. Useful for baking complex setups involving interactions between different physics types. Free bakes of all physics systems in the scene, even those of different types. Bake all physics systems in the scene to the current frame.